This is destined to become a tale of legend not unlike Jason and the Golden Fleece. Actually, none of my adventures are destined to work their way into local folklore. They will almost certainly just fade into the internet ether. Enough of that depressive musing about not having a legacy... rare bird story time! I was doing some work in the Bush Arm of Kinbasket Lake, northwest of Golden, when I encountered a bird a little off course. 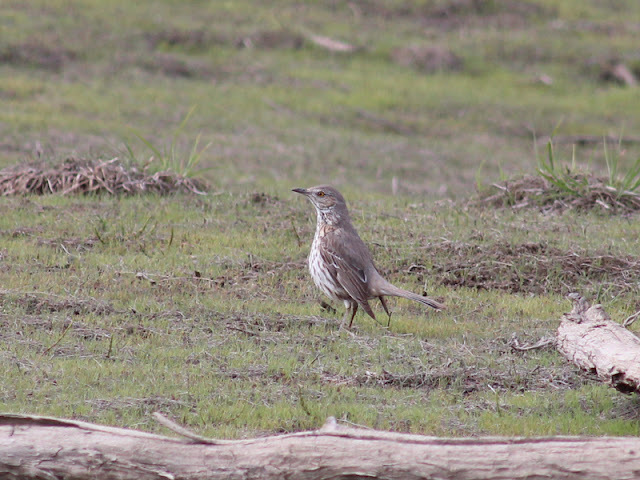 In the spring, Sage Thrashers can turn up just about anywhere. Anywhere can be the middle of nowhere and that's exactly where I was! While doing surveys on May 18th, my co-worker said "What's that? ", pointing at a tan-coloured bird approximately 50 metres away. I shot up my binoculars and caught a quick glimpse of the bird hopping up to the base of a cedar stump, cocking its tail once and then vanishing under the stump. I was thoroughly intrigued so I dashed over to further investigate. As I swiftly walked towards the mystery bird, two American Pipits flushed up and made me wonder if my sanity was in check. That wouldn't make sense for what I saw! The bird then popped out on the other side of the stump and for a split second I thought it was a female Mountain Bluebird because I wasn't ready for such a rarity. My binoculars went up and my jaw went down... a Sage Thrasher had wandered up the Rocky Mountain Trench and ended up right in front of me! place running from cedar stump to cedar stump like a roadrunner! I have only seen Sage Thrashers in B.C. a handful of times within their very restricted breeding range. I have seen them once or twice on Nighthawk Rd. (west of Osoyoos), once or twice at White Lake (southwest of Okanagan Falls), and once on Anarchist Mountain (east of Osoyoos). The advantage of seeing them in a very open landscape is obvious - I was able to watch the thrasher running across open patches! I have heard of other species of thrashers doing this, such as LeConte's and Crissal, but I didn't know Sage Thrashers did it. It was very cool to watch. It would raise its tail and take long strides as it scurried through the open, which seemed almost roadrunner-like. I have been fairly lucky the last few years with rare birds found during work. In 2009, I serendipitously found a singing Northern Parula and followed it up with a male Chestnut-collared Longspur a couple days later while working south of Nakusp. The next year, once again working south of Nakusp, I had a Red Phalarope in the fall which is an excellent bird to find away from the coast. With a Sage Thrasher already under my belt for 2012, it's hard not to be optimistic about the prospects of another exciting find! As it stands, I feel I can run off the seratonin from the thrasher sighting if nothing else materializes this year!